EcoCheques: Why do we find them such a bother? When you sign a work contract in Belgium you might be told that EcoCheques – vouchers to buy green products – are included as part of the salary package. EcoCheques can be used to purchase certain ecologically minded items at certain shops. Launched in 2009, EcoCheques were launched to allow Belgian companies to increase employee benefits while paying less tax and to encourage more ecological consumption. But Belgian natives and expats alike have historically struggled to spend their EcoCheques – up to €250 annually. Previously only distributed as paper cheques, the tendency was to stow them away for larger ecological purchases – like an energy-efficient refrigerator – only to forget them the day of the purchase. Or they wound up shoved in drawers, forgotten until they expired. It was easy to understand: Very few products could be bought with EcoCheques, and they were things a lot of urbanites or renters didn't need much of - potting soil or energy-saving water heaters, for instance. But the EcoCheque market has evolved substantially in the last few years, and now it's easy to spend those cheques - or to use digital EcoCheques, a convenient card some employers are now handing out. HOWEVER: Confusion still exists due to a couple of situations. First, there are two companies that distribute EcoCheques, Edenred and Sodexo. Though retail outlets that accept one generally also accept the other, the Sodexo cheques are now called EcoPass. Second, shops that accept the paper form of EcoCheques don't necessarily accept the electronic version. If you have a place in mind to spend them, it's best to check to confirm that you can spend the kind of cheques you have. The good news is that a lot of outlets that accept EcoCheques put a sticker in the window. So paying attention to those storefronts when you're out and about is worth it. In any case, here's a few suggestions for making spending EcoCheques easy to do. This is an easy one: Eurostar and Thalys are expensive, and they both take EcoCheques. You can possibly use them all up in one go on a simple city trip. You need to book through Thomas Cook to use your cheques. But it gets even better. 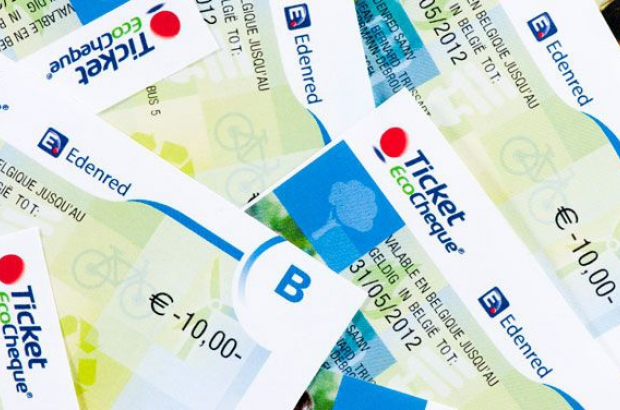 Belgian national rail SNCB also accepts EcoCheques. You can use them to buy single tickets or passes. Fair warning: You cannot use them for season passes, and only the paper EcoCheques are accepted. And if you care for a weekend away, you can also use your EcoCheques to pay for accommodation anywhere in Belgium that sports the Green Key Label. Many hotels, hostels and campsites across the country have the label - a sign of sustainable practices. Another no-brainer: Spend your EcoCheques at the freakin' grocery story. Both Delhaize and Carrefour except EcoCheques on all products that have been EU certified organic (the green label with those stars in the form of a leaf) or with the Biogarantie logo. This applies to almost all organic products they sell, just check the back of the product for one of the labels. Delhaize in particular has an ever-expanding range of organic products. Whereas it used to be limited to vegetarian products like veggie burgers and tofu, now you can find a whole slew of fresh organic produce, eggs, rice, yoghurt and much more. EcoCheques can also be used to buy food at organic food shops. Just check with them before loading up because - contrary to what the EcoCheque brochures would have you believe - the label on the product isn't enough. The shop ultimately decides if it's going to accept the cheques or not. Because daily transport is an eco-conscious choice, many bicycle shops accept EcoCheques for all kinds of merchandise, including electric bicycles. In Brussels, many bike shops accept EcoCheques, inlcuding Velodroom , Eddy Sport and Zennevelo. And you can even learn how to drive a car in the most economical way possible through an EcoCheque-paid eco-driving course. VAB, with outlets just outside Brussels, accepts EcoCheques for their course. Many amusement and cultural venues accept EcoCheques for admission. This includes the hands-on science centre Technopolis in Mechelen, Antwerp Zoo and Theatre Royal du Parc in Brussels. Most energy-efficient electronics and appliances can be bought with EcoCheques. Media Markt, for instance, accepts EcoCheques, as does Krefel and Vanden Borre. Very useful information, not necessarily passed as the Eco-cheques are passed to you in the office..
Well the cheque is one of the major form of paper which is one of the main source in business. All the business man can evaluate the following assignment writing service to get the new check book from your bank online. Writing skills of author are really impressive.